I had a nice big head of cauliflower in the fridge, knowing it would make for a nice soup or a puree of some sort, something easy. 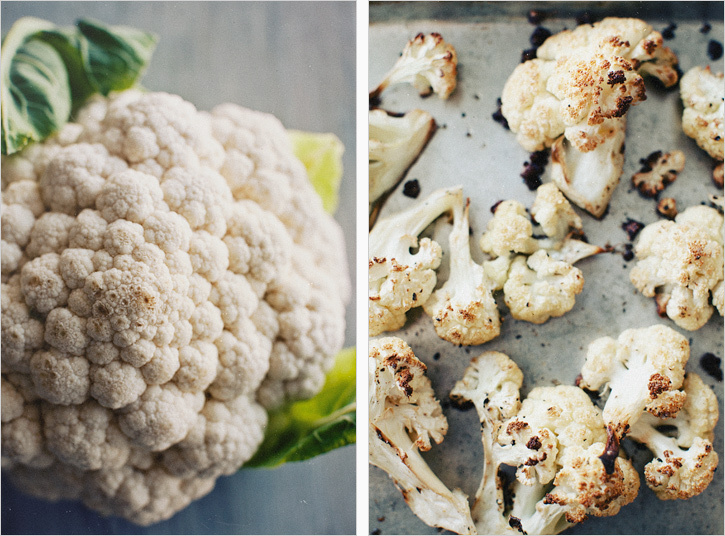 I'm partial to roasting most vegetables this time of year, and there is something about the crusty edges and nutty taste of a roasted cauliflower floret that certainly shames any past habits of steaming. The high heat of the oven brings out the natural sugars in the vegetable and rounds them out, caramelizing them with charming flecks of brown, hence the color of my soup. 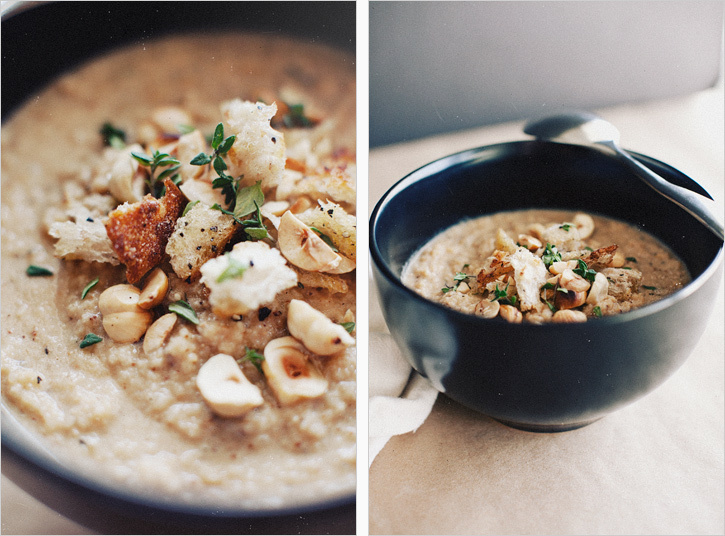 There are two ways to go with a cauliflower soup, depending how rich you want it. While the rainy days passed, I scribbled notes of browned butter, a bit of cream, maybe some shaved grano padano cheese on top. Then we went to San Francisco for a few days, and ate some pretty wonderful food, so I decided to scale back that decadence just a bit. I'm all for those ingredients in moderation, but my favorite jeans were feeling snug, so here we are with a broth base and I don't feel like I'm missing too much. If you want more richness, replace some of the broth with cream and dress it up with cheese or browned butter as you wish. Even after a good run in the food processor, there is some texture to this soup, so enjoy it for what it is. In other news, we've been married a year this Sunday, so that's really exciting. Time flies when you're trying to figure out how to make a book together. I love, love. Like really love it. I was eating some leftovers today and was thinking that if you halved the broth, this would make a nice puree underneath your protein of choice - sort of a nice alternative to mashed potatoes. Just a thought. Preheat the oven to 450'. Cut the cauliflower into florets and spread them on a rimmed baking sheet. Drizzle with olive oil, sprinkle the fresh nutmeg and a hefty pinch of salt and pepper and toss everything to coat. Bake on the middle rack for about 35-45 minutes, tossing the cauliflower halfway through, until they are fully roasted and you see a good amount of brown edges. There is a pretty wide grace period here. Remove to cool. While the cauliflower roasts, start the broth. Heat the oil in a saucepan and saute the shallots and garlic for about 5 minutes to soften. Add the vegetable broth, dried thyme and vinegar and warm through. When the cauliflower is cool to touch, add it and the broth mixture to a food processor or blender and process until smooth. Taste for salt and pepper. If you want more contrast, add a bit more vinegar. Add it back to the saucepan to keep warm. Serve each portion with a few croutons, chopped hazelnuts and a pinch of fresh thyme leaves and shaved parmesan, if using.